Revenues from the plate help to make the Cape & Islands a better place to live and visit! Plate revenues support grants, loans, the arts, environmentally compatible economic development programs and the growth of our year-round economy. Click here to visit our Beneficiaries Page. 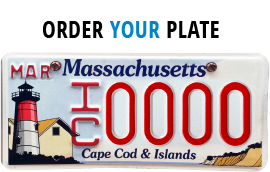 Introduced in 1996, the Cape & Islands license plate features Nauset Light in Eastham (considered one of the most picturesque and photographed lighthouses in America), along with the cliffs of Siasconset in Nantucket and Gay Head on Martha’s Vineyard. The plate captures the distinct beauty of this coastal region, and is the perfect way to keep alive cherished memories of sandcastles and seashells, flip flops and fried clams. Read below for some comments from our “Ambassadors” as to why they love their Cape & Islands Plate!